Our Environmental and Recycling Division develops Environmental Technologies for the assessment of environmental health (soils, surface and groundwaters) and treatments associated with their cleaning and remediation. Furthermore, in the field of environmental management, we analyse the sustainability of processes, products (ecodesign) and services throughout their life-cycle, using methodologies and developing tools such as environmental (LCA), economic (LCC) and social (SLCA ) life-cycle analysis. In the field of mechanical recycling we work on the treatment of material flows from post-consumer waste of all types along with industrial rejects. 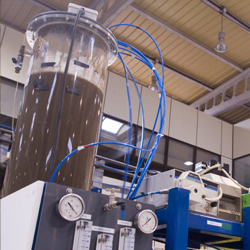 Likewise, we develop ad hoc processes in the field of energy recovery aimed at obtained fuels from waste and also develop processes for the chemical recycling for plastics or the production of biofuels from renewable sources.